Groundhog Day is the day when people look to the groundhog to predict the weather for the next six weeks. 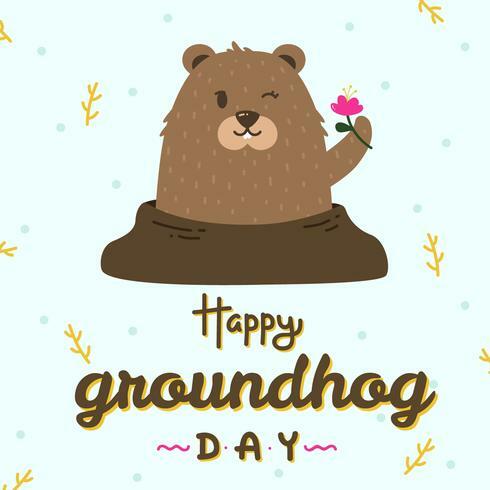 Folklore says that if the sun is shining when the ground hog comes out of his burrow, then the groundhog will go back into its burrow and we will have winter for six more weeks. However, if it is cloudy, then spring will come early that year. When is Groundhog Day celebrated? This is a tradition in the United States. It is not a federal holiday and is mostly just for fun and something that weather forecasters like to talk about for entertainment. There are a number of celebrations throughout the United States. The largest celebration takes place in Punxsutawney, Pennsylvania where the famous groundhog Punxsutawney Phil has predicted the weather each year since 1886. Large crowds of well over 10,000 people gather here to see Phil come out of his burrow at around 7:30 am. Other celebrations take place in towns such as Lilburn, Georgia with their groundhog General Beauregard Lee; Staten Island, New York with Staten Island Chuck; and Marion, Ohio with Buckeye Chuck. There are even celebrations in Canada. The origins of Groundhog Day can be traced to German settlers in Pennsylvania. These settlers celebrated February 2nd as Candlemas Day. On this day if the sun came out then there would be six more weeks of wintry weather. At some point people began to look to the groundhog to make this prediction. The earliest reference to the groundhog is in an 1841 journal entry. In 1886 the Punxsutawney newspaper declared February 2nd as Groundhog Day and named the local groundhog as Punxsutawney Phil. Since then the day and tradition has spread throughout the United States. This day is the official holiday of the University of Texas at Irving where they have a big celebration each year. The 1993 movie Groundhog Day starring Bill Murray took place in Punxsutawney, Pennsylvania and made the holiday even more popular. How accurate the predictions of the groundhogs are is up for debate. People who organize the day say that they are very accurate. However, others say it's just luck. In Alaska they use a marmot and have a marmot day instead. Another name for the groundhog is the woodchuck. It is part of the squirrel family. Punxsutawney Phil normally lives in a nice climate controlled home in the local library throughout most of the year. He is moved up to Gobbler's Knob on February 2nd, where he makes his annual weather prediction. Phil was named after King Phillip.